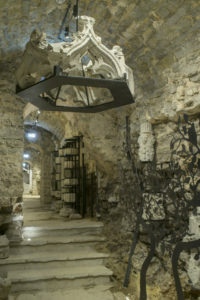 The Carved Stone Museum, which was opened in 2016 in the tunnels under the 17c Ingermanland bastion, offers tours that present the Estonian tradition of using local limestone as a material both for building and decorative use. Tours can be booked at the office of Kiek in de Kök. In the summer season, the tunnel is also open to individual visitors who can reach the museum from the entrance on the Vabaduse väljak (see map here) beneath the Freedom Monument. Eesti Paeliit (the Estonian Limestone Association) was founded in 1992. to disseminate knowledge of local limestone and advice in its use. Declaring limestone a “Nationals Stone of Estonia” has furthered scientific research of the material.